Christian and Gillies performed experiments using hypothalamic cells taken from embryonic rats, examining the impact of 17ß-estradiol and octylphenol on the normal uptake by these cells of dopamine. They performed the experiments to test whether EDCs could influence developing cells within the central nervous system directly. This was of interest because previous experiments had shown neuorendocrine and behavioral effects, but it was not clear whether the mechanism of action was directly upon the CNS or upon other elements of the endocrine system (for example the testes) that then had a secondary effect on brain development. The hypothalamic dopaminergic (DA) neurons used have established roles in neuroendocrine regulation, express estrogen receptors and are sensitive to perinatal manipulations of the hormonal environment as they mature in live animals and in cell culture. Christian and Gillies measured the uptake of dopamine in cells treated with different concentrations of the two compounds. They found effects by both compounds, with significant effects of 17ß-estradiol at less than one part per trillion and the octylphenol effect visible 10 parts per trillion. These are astoundingly low levels. They also observed that over the range of concentrations used in the experiments (which varied by 8 and 7 orders of magnitude for 17ß-estradiol and octylphenol, respectively), the dose response relationship strongly followed a non-monotonic form. High levels of exposure eliminated the response whereas intermediate levels revealed it. 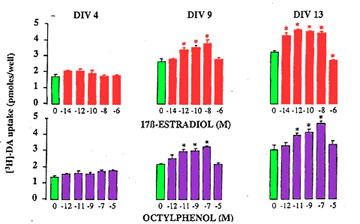 Compare the height of the green bars (controls) to different levels of estradiol and octylphenol treatment. Cells in culture were sampled at successively later days in the experiment (DIV 4 through DIV 13). "This is the first report of a functional, neurochemical response to an environmental estrogen. ... The data thus support the hypothesis that inappropriate exposure to environmental estrogens at critical stages of development could potentially perturb the organizational activities of endogenous estrogen on selected neuronal populations in the CNS"